The first time that I heard of Michaelmas was actually while reading Jane Austen’s Pride and Prejudice. A ball was supposed to be held slightly before Michaelmas, and honestly I had no idea when it was or what the big deal . Well, apparently Michaelmas is today, September 29! And it’s a feast day that particular honors St. Michael, the Archangel, who is the leader of the angels and of the army of heavenly hosts. Now, one of the coolest things about the Catholic faith it’s universal. When I went to Rome and visited St. Peter’s square to pray the Angelus along with Pope Francis, so many people from so many different countries were out there, yelling and cheering and waving the flags of their home countries. It made me feel sorry that I wasn’t waving an American flag! This universality means that each culture brings something special to the faith — and it’s especially evident in art! Archangel St. Michael, c. 18th century. Parroquia de Santa María la Mayor, Ezcaray, La Rioja, Spain. St. Michael is typically described as holding a flaming sword. But, for the Spanish colonials, a musket was a weapon that literally required a spark to ignite the gun. Thus, it was termed a “firearm”! 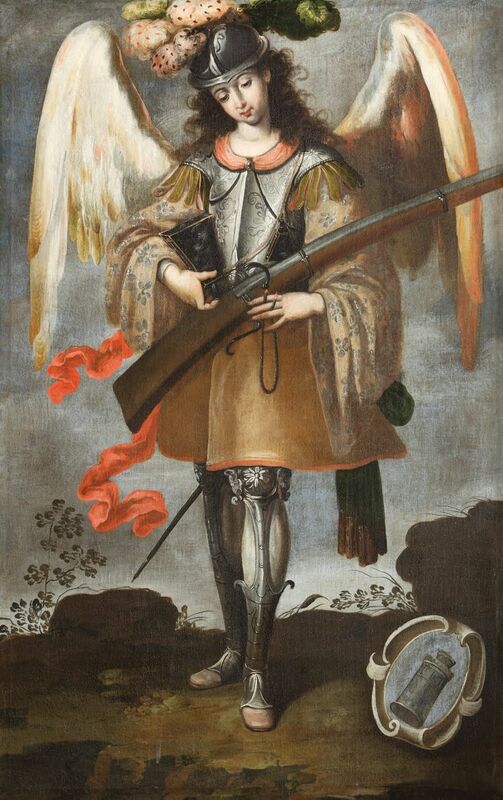 So, while it’s not a flaming sword, it is fitting that an artist living in colonial Spain would depict St. Michael holding this devastating weapon that was so important to the Spaniards as they colonized. And it gives us a glimpse about the importance of this weapon, which took precedence over the sword, both in battle and in art. Anyway, to celebrate this day in particular, let’s pray the prayer of St. Michael the Archangel! Which also happens to be the prayer that my daughter and I say after she’s had a bad nightmare… since what better way to allay fears of the dark and unknown than to call upon the archangel destroying Satan?